It took me forever to remember the words that make up NaBloPoMo. 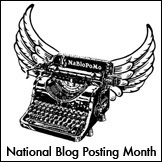 National Blog Posting Month. I signed up…again. Last year, I signed up for NaBloPoMo to encourage myself to write every day. In turn, my writing helped me get through one of the worst months of my life. This year, I’m taking the challenge to write 30 posts in 30 days to try and write every day. 6 Responses to NaBloPoMo, Anyone? I don't know that I could even make a week myself. But I will be here reading!! I didn't know November was NaBloPoMo!Did you know it's also NaNoWriMo (National Novel Writing Month)? I am not participating in NaBloPoMo, but I am participating in NaNoWriMo! (Wow, that's a mouthful!) The goal of NaNoWriMo is to write at least 50,000 words of a novel during the month of November. Basically, that works out to 1,667 words (about six pages) per day. You can check out the website http://www.nanowrimo.org for more details. Go girl! I am not doing it this year, though I did it a couple years ago and love it. But it will be fun and it's great for your writing! Looking forward to reading your enjoyable writing! I can't commit to everyday – I'm barely managing a few times a week! Good luck and I am looking forward to reading your 30 posts this month!